As a baton twirler taking the fields on a Saturday in the fall, you have the unique opportunity as part of the band to have a lot of eyes on you at once. While some cringe at the potential pressure those eyes may bring, others tackle it head on. Some even recognize the power behind their position and so that they can to make a difference. Today's #TwirlerTuesday spotlight is a special feature on some ladies who are sporting some pink on the field. 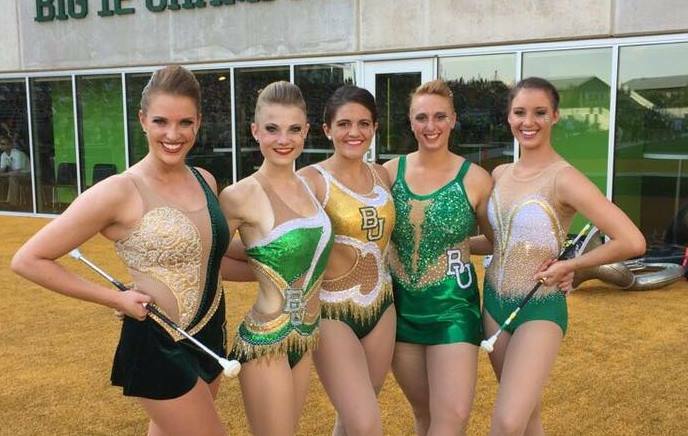 October is Breast Cancer Awareness Month and the Baylor Golden Girl Feature Twirlers are raising both awareness and money for the cause. 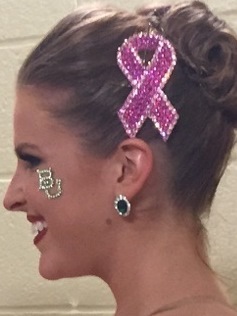 Caroline Carothers, a Baylor sophomore and math education major, came up with an idea to spearhead a fundraiser during her national twirling competitions last summer. "Every year, there is one day during nationals dedicated to Twirling for the Cure, an organization in which twirlers form across the nation come together to raise awareness about breast cancer an honor those who have fought the disease, " Caroline explained. "I thought about how we could make a difference by doing something I enjoy - rhinestoning. I though as a team, we could make and sell the hairpieces and give the profits to Twirling for the Cure. Through social media, it could gain momentum nationwide." Indeed it has. In just one month, the Golden Girls have sold over 200 hairpieces and pics, raising $2,300 from Twirling for the Cure. Friends and family are also pitching in to help make these sparkly ribbons, gluing ove 38,000 rhinestones in total. Twirlers from 20 states will be sporting their pink rhinestone ribbons during college and high school football games in October. Needless to say, the Golden Girls' fundraising initiative has exceeded their expectations and they are just tickled pink!